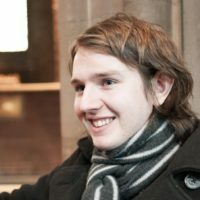 Chris Fitzgerald-Lombard,originally from Norwich, graduated from Birmingham Conservatoire having studied singing with Julian Pike and Andrew King. As a choral and ensemble singer Chris has worked with some of the UK’s leading ensembles and conductors. Recently he has appeared with Ex Cathedra, Genesis Sixteen, Armonico Consort, the Convivium Singers, the Chapter 5 Vocal ensemble and Birmingham Conservatoire Chamber Choir. Chris has worked with renowned conductors including Paul Spicer (Birmingham Bach Choir, Finzi Singers), Jeffery Skidmore (Ex Cathedra), Malcolm Archer (Wells and St Paul’s Cathedrals), Harry Christophers and Eamonn Dougan (The Sixteen). Increasingly in demand as a soloist Chris’ recent solo engagements have included works by Britten, Dvorak, Monteverdi, Mozart and Walton. Chris, now living in London, is a ‘full time’ freelance singer, which sounds very glamorous but he would, however, point out that the financial benefits are similar to unemployment and you’re always out when the good TV is on!